after 110+ friday’s of the week in photos, I’ve decided it’s time to retire it and start something new. the idea behind it is to share four things I’ve collected throughout the week. it can be anything from a quote I’ve held onto, a recipe I’m loving, exciting life events, a lesson I’ve learned, and of course ..photographs. I want it to become less of ‘recap from my week’ and more of a takeaway for us all. 1 // which brings me to the new finally defined direction of little lessons in a big city. throughout the past few years, I’ve been working to transform this creative space from a personal journal to a full-blown lifestyle blog. I don’t want it to be necessarily about my day-to-day, but rather a collection of things that make each day better. many people start the new year with huge, often times unattainable goals, but I’m asking all of you to shift your focus with me in 2014.
and those little things will be what you can find on LLinaBC. a collection of how to’s, do-it-yourself projects, recipes, fashion + beauty tips, and the occasional life update. you don’t have to make drastic changes to better your life, it’s all about the little things. like a handwritten note from a friend, a good glass of wine, a new piece of artwork, or a successful DIY project. 2 // pretty, little snowflakes. aren’t they beautiful? 3 // santa put this water bottle in my stocking and it has not left my side yet. I’ve definitely been drinking more water. and even eating quite a bit healthier. I have pictures of wedding dresses + bikinis dancing in my head. only 9 months to go. 4 // cheers to making 2014 the best year yet. did you know it’s tomorrow? thankfully it is not a holiday [J] & I lose sleep over. because if it was, we’d both be in big trouble. we’ve been so busy moving & getting settled in, we didn’t even know it was this week. until our parents reminded us. [J] & I make it a point to do little things for each other allllll year long. because on the random days, they mean more. that doesn’t mean you can completely skip the hallmark day of love. it’s the perfect opportunity to drop a friendly reminder of how much you love the person you share your life with. how much you appreciate & are thankful for them. [friends included]. here are some of my favorite ways to deliver love notes. on the fly. 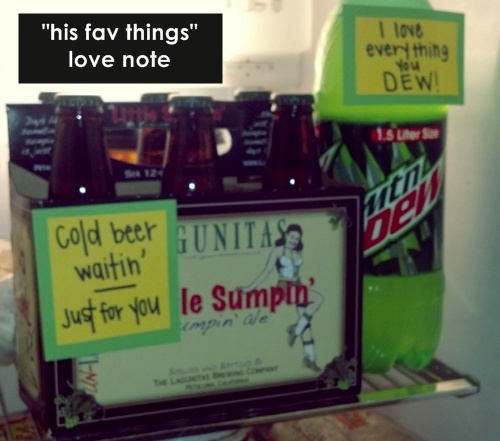 “his fav things” love note: out running errands? grab a 6-pack of his favorite beer. or soda. or snack. stick a quick ‘love note’ on the item ..& voilà! 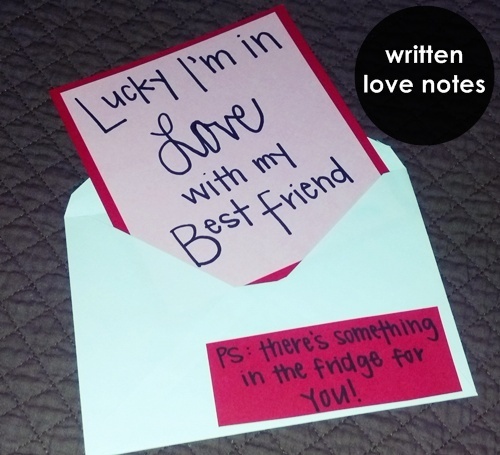 written love note: you can’t beat a traditional handwritten love note. make it pretty with colorful card stock, a fitting quote ..& a personal message. chocolate love note: grab a bag of his favorite candies ..& strategically place them to spell out a sweet [pun intended] message. I don’t know what [J] was more excited about: the thoughtful “I ♥ U” or the thirty-five dove chocolates. 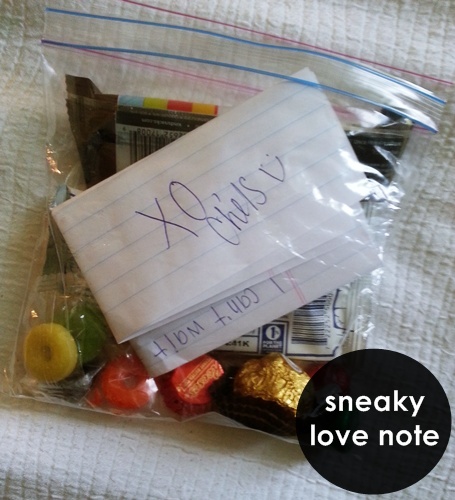 sneaky love note: get your sherlock holmes on and put a surprise where he least expects it. in his car. in his work bag. in his wallet. I snuck a bag of treats & a love note into [J]’s suitcase before his last work trip. so whether you’re still searching for the perfect way to say ‘I love you’ on valentine’s day. or looking for ideas to make the ‘random’ days a little happier ..I hope these help! go ahead. send this to the mister in your life. you can never have too many good ideas.